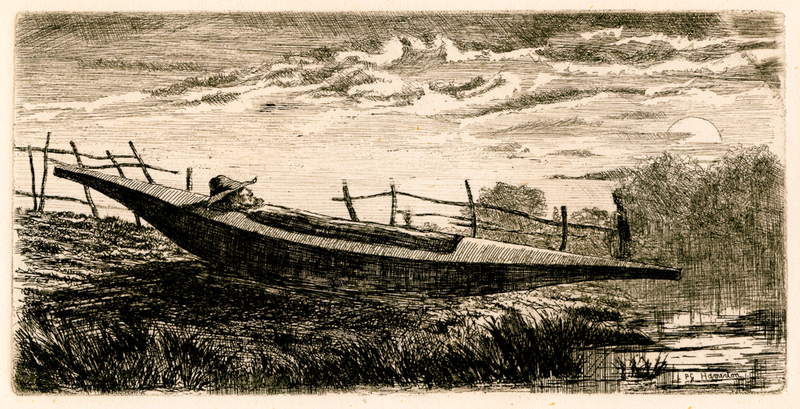 Home / Shop / Prints / A Night in the Canoe / 1860s? A Night in the Canoe / 1860s? Philip Gilbert Hamerton (English, 1834–1894) lived most of his adult life in France. An author and artist, he was a major force in promoting the international revival of etching in the late 19th century. Sometime before 1871, Hamerton took a canoe trip down the river Arroux in central France. He drew the views he encountered with an etcher’s needle on prepared copper plates. Hamerton left completed plates at inns along the way, and picked up fresh ones he had sent in advance. The final result was a collection of 60 small etchings, fresh, beautiful, and evocative. 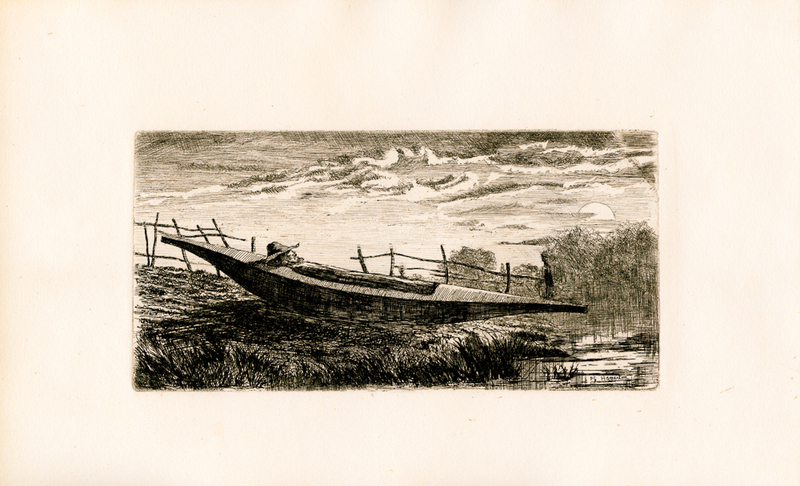 37 of those etchings were bound into “The Unknown River,” Hamerton’s memoir of his journey. Later editions of the book would appear with a much smaller selection of etchings, and still later editions would include no original etchings. We believe the prints offered here are from the 1872 American edition, produced in England. It is unfortunate that these etchings were at some point removed from the book, but we are still glad to have many of them to offer to you. No art is more agreeable for direct work from nature than etching is. The rapidity of it, and its freedom, are greatly in its favor, and so is its remarkable independence of damp and wet. Many of the plates in this series were immersed in the river, after being etched, when the artist was upset: others were executed in bad weather with the rain literally pouring over the copper in a manner which would have rendered any other kind of drawing quite impossible.